The Heinkel He 59 was a German biplane designed in 1930 resulting from a requirement for a torpedo bomber and reconnaissance aircraft able to operate with equal facility on wheeled landing gear or twin-floats. In 1930, Ernst Heinkel began developing an aircraft for the Reichsmarine. To conceal the true military intentions, the aircraft was officially a civil aircraft. The He 59B landplane prototype was the first to fly, an event that took place in September 1931, but it was the He 59A floatplane prototype that paved the way for the He 59B initial production model, of which 142 were delivered in three variants. The Heinkel He 59 was a pleasant aircraft to fly; deficiencies noted were the weak engine, the limited range, the small load capability and insufficient armament. The aircraft was of a mixed-material construction. The wings were made of a two-beam wooden frame, where the front was covered with plywood and the rest of the wing was covered with fabric. The box-shaped fuselage had a fabric-covered steel frame. The tail section was covered with lightweight metal sheets. The keels of the floats were used as fuel tanks - each one holding 900 L (238 US gal) of fuel. Together with the internal fuel tank, the aircraft could hold a total of 2,700 L (713 US gal) of fuel. Two fuel tanks could also be placed in the bomb bay, bringing the total fuel capacity up to 3,200 L (845 US gal). The propeller was fixed-pitch with four blades. During the first months of World War II, the He 59 was used as a torpedo- and minelaying aircraft. Between 1940 and 1941 the aircraft was used as a reconnaissance aircraft, and in 1941-42 as a transport, air-sea rescue, and training aircraft. The trainer models survived slightly longer in service than operational models, but all had been retired or destroyed by 1944. 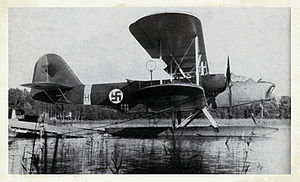 Some aircraft were operated by the Condor Legion in Spain during the Spanish Civil War in 1936 as coastal reconnaissance and torpedo floatplanes. As the air-sea rescue aircraft, despite carrying Red Cross markings, were being used for reconnaissance the British Air Ministry declared from July 1940 they were targets. Even before then some had been forced down by British aircraft. He 59a : first prototype. He 59A : test and evaluation aircraft. 14 built. He 59B-1 : 16 pre-production aircraft. He 59B-2 : improved version. He 59B-3 : reconnaissance aircraft. Green, William.War Planes of the Second World War: Volume Six: Floatplanes. London: Macdonald, 192. Heinkel He 59 Pictures and Heinkel He 59 for Sale.